My November Knoshbox is Here! Yay! 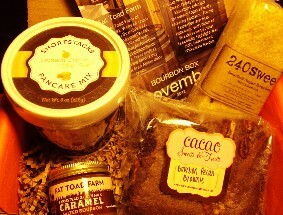 I love it when my foodie tasting boxes arrive! It’s almost as wonderful and amazing as when I get tea in the mail. Almost, but not quite. Tea still wins out over food! The theme of this month’s Knoshbox is “Bourbon Box” which got me excited! Foodzie – before it became Joyus … a transition which lead me to seek out new tasting boxes, which lead me to discover Knoshbox, and I’m so much happier with Knoshbox than I was with Foodzie! – anyway, Foodzie had a Bacon and Bourbon box about a year or so ago, and I loved it. I’m not so keen on Bourbon (I drink tea, and am not a big fan of alcohol … I’m a tea-totaler! hahaha! ), but, I did love the bourbon products that were in that Bacon and Bourbon box, so, I am keeping an open mind and a hungry stomach (that sounds kind of Iron Chef-ish, doesn’t it?) to the possibilities of this box. But what excites me more than the theme of this box, is the items it includes. 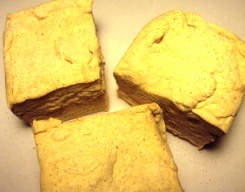 First, there’s the handmade marshmallows from 240Sweet … Bourbon Sugar Bourbon Marshmallows! For those of you who haven’t read many of my reviews on this blog, 240Sweet are my #1 choice when it comes to marshmallows, because they’re AWESOME! And I love that Knoshbox decided to include them in this box. It makes me love Knoshbox all the more! Also in this box are Bourbon infused brownies! Yes, you read that correctly: Bourbon infused brownies from Cacao Sweets & Treats. Then there is a jar of Fat Toad Farm caramel (Bourbon infused caramel!) and Bourbon Salted Pecan pancake mix from Southern Culture. Yes, this is an amazing box … and I’m excited to try each and every item. Now, Knoshbox, you know I love you, right? How about a tea time box? I’d be happy to serve as a consult on that box, if you want. 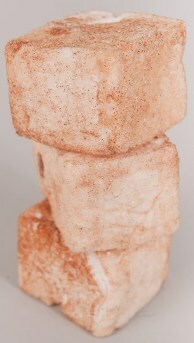 I love chai … I love 240Sweet’s marshmallows … it’s kind of a no-brainer! I knew I’d love these puffs! They are so fluffy and sweet, but also deliciously spicy. And these aren’t like vanilla marshmallows that have been rolled in finely ground spices and tea, the spiced tea has been infused into the marshmallow, flavoring every inch of these huge marshmallows, making for a very satisfying tea and marshmallow experience … all in one! Of course, a cup of tea along with it doesn’t hurt! Believe it or not, though, I found these to be better with a cup of hot cocoa. I put one in the cocoa to melt while I munched happily away on another (for review purposes only, of course, I needed to see what it tasted like without the cocoa’s influence). Because of the spices and the hint of tea in the marshmallows, they offered a lovely layer of flavor to the cocoa that I really enjoyed. I can taste the cinnamon and the peppery kick of the ginger in this. I also taste hints of clove and I can even taste the subtle note of tea in there. The aftertaste is a little bit like cardamom. The spices are very warm and delicious, and offer a pleasing contrast to the sweet flavor of the marshmallow base. 240Sweet’s marshmallows are my favorite and there’s a reason for that. They’re superb! Have you ever tried a homemade marshmallow? They are so much better than anything store-bought. You really MUST get to 240Sweet and order some Marshmallows. They have so many tempting flavors from which to choose … and this one may be my favorite one yet. I love the spices here – they’re spicy without being out-of-control hot … tempered by the sweet, luscious, puffy marshmallow. So good. I went with “hot chocolate” – but not in the way you might think! I enjoyed these marshmallows with a cup of Flaming Hot Maté from 52Teas! Roasted Yerba Maté, cacao nibs and cayenne pepper provided an interesting contrast to this sweet and salty treat. The tisane is spicy and chocolate-y, and the marshmallow is gooey, sweet, salty goodness! YUM! These are also tasty as chai hot chocolate toppers … read my “recipe” below! If you’ve read very many of my sweet treat reviews, you area probably aware that I love salted caramel. I love how the salt contrasts with the sweet caramel flavor. So when I find something that’s salted caramel – whether it’s candy, cupcakes or even marshmallows, I MUST try it! And of the salted caramel treats that I’ve tried thus far, I think that these marshmallows just might be my favorite … or at least in the top three! These are incredible. I tried my first one as a topper for a cup of hot chocolate (going back to my Ski Lodge tasting box, I brewed up a pot of Masala Chai from Yogic Chai and melted one of the Dark Hot Chocolate on a Sticks in the hot chai, and then topped the tea infused hot chocolate with one of these enormous marshmallows. Oh, and these marshmallows are huge, one is more than enough for a cup of hot chocolate!) Let me tell you, this cuppa was heaven! As the marshmallow began to melt, I could taste the salty caramel together with the spices and the creamy, rich chocolate. Oh so good! The next day, I enjoyed one of the marshmallows with the Flaming Hot Maté, as I mentioned above, and it’s hard for me to say which way I enjoyed these marshmallows more! Both were amazing. Incredible. Just incredible. These marshmallows are simply the BEST marshmallows I’ve ever tasted. Saigon cinnamon and granulated sugar coat a Very Vanilla Bean puff. I love the combination of cinnamon and chocolate, so I couldn’t resist brewing some of this Organic Chocolate “O” from The Tea Spot to sip with these marshmallows. It was a perfect choice. The tea is rich and chocolate-y, and the Saigon cinnamon gave this treat a perfectly warm, spicy taste that contrasted with the sweet of the marshmallow and the tea so nicely. YUM! 240Sweet has quickly become my favorite source for handcrafted marshmallows. Why? Because they have such an amazing assortment of flavors, and every marshmallow that I’ve tried from them thus far has been so remarkably fresh and fluffy and absolutely delicious! Their Elephant Ear Marshmallows – at first glance – appear to be nothing more than vanilla marshmallows dredged in cinnamon and sugar. But the chefs at 240Sweet chose to use Saigon Cinnamon, so the cinnamon flavor is strong and adds a zesty warmth to the puff. What I really like, though, is how the cinnamon offers a nice contrast to the sweetness of the puff… making these so irresistible! YUM! I’ve tried a few of the marshmallow offerings from 240Sweet and I think that these are my favorites so far. The contrast between spicy and sweet is absolutely amazing. All of our puffs are hand-crafted in small batches using local, all-natural and real foods. 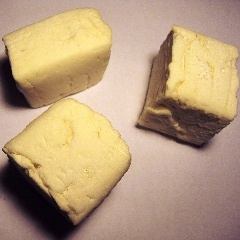 Each of our hand-cut marshmallows has a different texture, density and aroma. Take a moment to smell the puff before biting into it. Then enjoy the different notes. We suggest sampling all the flavors both as they come and lightly toasted. I wanted something malty and rich to enjoy with these marshmallows, so I selected this Assam tea from Steven Smith Teamaker. The malty flavors of the Assam tea brought out some of the malty tones in the Marshmallows. This has to be the most unusual flavored marshmallow I’ve yet to come across. At least, from my perspective, it is unusual. It’s even unusual that I would be trying it, because beer is not something I drink. I don’t like beer, I’ve never really cared for the stuff. But, something about a beer infused marshmallow intrigues me just a little bit. From the outside, this looks like most handcrafted marshmallows – it’s big and fluffy, and slightly off-white in color. I can smell the beer, but it isn’t a terribly strong scent. The flavor of the beer in the marshmallow is – thankfully – mild. Oh, it’s definitely discernible. But, it doesn’t taste as though I just took a big swig of beer. It tastes like marshmallow, first and foremost, with a hint of beer mingling with the sweet flavor of the confection. This was also a marshmallow that I felt I had to experience toasted, and since I don’t have the grill fired up and I don’t have the fireplace going … and I’m not camping, I utilized technology and used the broiler on my oven to toast one of these puffs. The heat adds an interesting element to the marshmallow, obviously, it makes it creamier, but I also noticed that the caramelized, crispy edges of the marshmallow had a malty beer taste that I hadn’t noticed in the non-roasted puff. I am not a fan of beer, as I’ve mentioned, but, I AM a fan of these Draft Beer flavored Marshmallows! I am really glad that I got the opportunity to try these!